If it feels like the Patriots are being flagged for offensive pass interference much more than ever before, you're not wrong. Through four games, the zebras have flagged the Pats for the most OPI penalties in the league at five total: two went against Rob Gronkowski against the Jaguars in Week 3, while Aaron Dobson, Julian Edelman and Kewshawn Martin have each been pinched for one apiece. 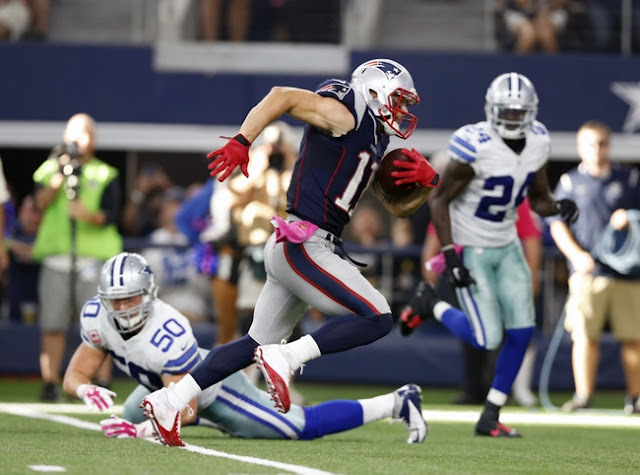 The calls against Edelman and Martin came in Sunday's game against the Cowboys, with both receivers running designed 'pick plays' to free up Danny Amendola, which wiped out huge gains for the wide out. Pats head coach Bill Belichick made his weekly appearance on WEEI's Dale & Holley on Monday and said that the league has made calling pick plays and rub routes a point of emphasis this season, and the Patriots are one of the best teams at running the plays effectively, it's simply a matter of perfecting the art. ...you can run those plays in practice or in games and they are all sometimes a little bit different, where those meshes are and who bumps into who and all that. I think offensively we as a league, that that rule has been enforced pretty consistently and everybody is getting called for those type things and we have to do a better job of coaching it, number one, that’s me. And then we have to do a better job of executing it as receivers of trying to get to where we are trying to go to, but without impeding a defender illegally. The Pats won't stop running pick plays, and they operate with the same mentality in which the Seattle Seahawks infamously hold and mug receivers on every play on defense because the officials won't call a penalty on every play. They just have to do a better job of pulling them off to free up crossing routes across the field.